Access Newark's top attractions like a New Jersey Devils game or a live Josh Groban concert all while staying at luxury hotel suites near the Newark Airport. 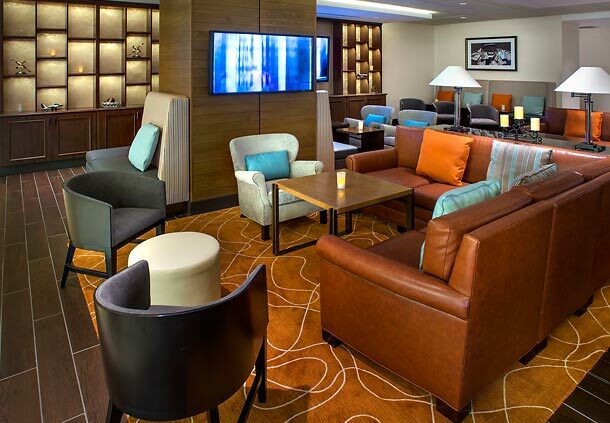 NEWARK, NJ--(Marketwired - Oct 7, 2013) - Located just ten miles west of New York City, the Newark Liberty International Airport Marriott is home to first-rate venues that host exciting entertainment and sporting events. Featuring luxury suites near Newark Airport and more than 13,260 square feet of banquet and meeting space, this Newark hotel near NYC is a perfect place for a memorable getaway. The New Jersey Devils, New Jersey's professional hockey team, play at the Prudential Center, the top sports and entertainment venue in northern New Jersey, just 10 minutes from the EWR Hotel. Catch a hockey game or watch a live concert by world-class musicians, like Josh Groban and Nine Inch Nails, who are both performing at "The Rock" in October. Or, see top acts at the New Jersey Performing Arts Center, including Smokey Robinson, Bonnie Raitt, and Kenny Rogers who are performing there in October, November, and December respectively. Located just steps from Newark Liberty International Airport (EWR) and minutes from downtown Newark, the Newark Liberty International Airport Marriott offers easy access to Newark's great venues and events. There's plenty to keep guests occupied between the Prudential Center, New Jersey Performing Arts Center, Jersey Gardens Mall, Newark Museum, and Liberty State Park, which offers ferry service to Ellis Island and the Statue of Liberty. The hotel is also a quick jaunt from the excitement of Manhattan and New York City. Guests can easily visit Newark's top attractions from the modern hotel, which has an indoor-outdoor connecting pool, a fully equipped fitness center, classic American cuisine at the Aviation Grill, and spacious guest rooms. Families who are visiting the area will also appreciate the "Kids Eat Free at Newark Liberty International Airport Marriott!" policy. For convenience and a great hotel deal near Newark Airport, stay at the Newark Liberty International Airport Marriott! The Newark Liberty International Airport Marriott is a peaceful oasis in the heart of Newark's International Airport that embodies modern luxury. This AAA Three Diamond hotel has high-speed wireless Internet access throughout the rooms and public areas, a business center, personalized concierge service, laundry service, on-site parking, and complimentary shuttle service to the airport terminals. The 585 renovated guest rooms and suites are outfitted with luxurious bedding, marble bathrooms, TVs with cable and premium movie channels, large work desks with ergonomic chairs, high-speed wireless Internet access, and coffee/tea service. After an exciting day spent exploring New York City, enjoy a casual fine dining experience at the Aviation Grill. Fitness-focused guests can work out in the fitness center or swim laps in the indoor-outdoor connecting pool. With 52 meeting rooms, an elegant 10,000-square-foot grand ballroom that can accommodate up to 1,100 people, and a total of 30,000 sq. ft. of meeting space, the hotel is also the venue of choice for meetings and events in Newark and northern New Jersey.